The 2007 season saw Panther Racing undergo another major expansion, its second in the team’s 10-year history, to a two-car effort in the IndyCar Series and the year marked Panther’s return to the developmental Indy Pro Series, the team’s first return to the league since a dominant 2003 championship. Vitor Meira’s amazing one-car effort from the previous year was now joined by new primary sponsor Delphi and the addition of the Super Aguri Company, which brought along talented Japanese open-wheel veterans Kosuke Matsuura to drive the No. 55 car in the IndyCar Series and Hideki Mutoh to pilot the team’s Pro Series effort. A year filled with high expectations for Meira didn’t turn out as planned, but the Brazilian was able to squeeze several highlights into what could have been a disappointing season. Despite a fourth place finish in the opener at Homestead, Meira was bitten by bad luck during some of his best days on the track. Consecutive suspension failures at Iowa Speedway and Richmond robbed two legitimate chances of victory, as Panther’s short-oval package continues to be one of the most consistent in the league. The Iowa failure was especially hard for the Delphi team, after Meira led 72 laps in the contest and it appeared the No. 4 was the car to beat. But it wasn’t all bad for Vitor, who collected his fourth straight Top Ten finish at the Indianapolis 500 in May, after nearly finishing fourth place during the first rain delay; a result that would have been Panther’s best in the Indy 500. Consecutive fifth place finishes at Milwaukee and Texas Motor Speedway were a strong addition to Vitor’s ten Top Ten finishes. 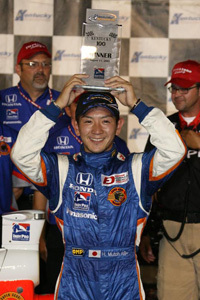 Matsuura, the former Indy 500 and IndyCar Series Rookie of the Year, simply couldn’t buy a break in 2007. After a promising start, Kosuke was taken out of the first two races by rival driver Jeff Simmons, and the second accident – at the street course in St. Petersburg – had Matsuura so frustrated he cursed on live ABC television. But despite the early setbacks, Kosuke battled back late in the year. He equaled his career-best finish of fourth place at Michigan and kept it clean at the inaugural event at Belle Isle for another Top Five result. For Panther, the 2007 highlight reel belonged to newcomer Hideki Mutoh. The 24-year-old driver hadn’t been to an oval racetrack in his life before sitting in his No. 55 Formula Dream Panther machine, and he drove like a seasoned veteran. Mutoh took fifth place finishes in his first four starts before starting from the pole and dominating every lap of the Liberty Challenge at the Indianapolis Motor Speedway for his first career victory, and Panther’s first win at Indy. Still determined to break through on an oval, Mutoh saved his best performance for the August 11th race at Kentucky Speedway, where the open-wheel star started from the pole again. While the final box score will show that Mutoh led all but one lap for his first oval victory, it didn’t come easy. Battling all night with Wade Cunningham and eventual- series champion Alex Lloyd, Hideki made a dramatic last-lap, three-wide pass for the victory in the final turn. 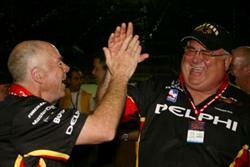 Mutoh then made his IndyCar Series debut at the final event at Chicagoland Speedway, where he proved to many of open-wheel’s best drivers that he belongs with the big boys. Mutoh finished eighth in his debut, ahead of both Panther regulars, who fell out of the race early.